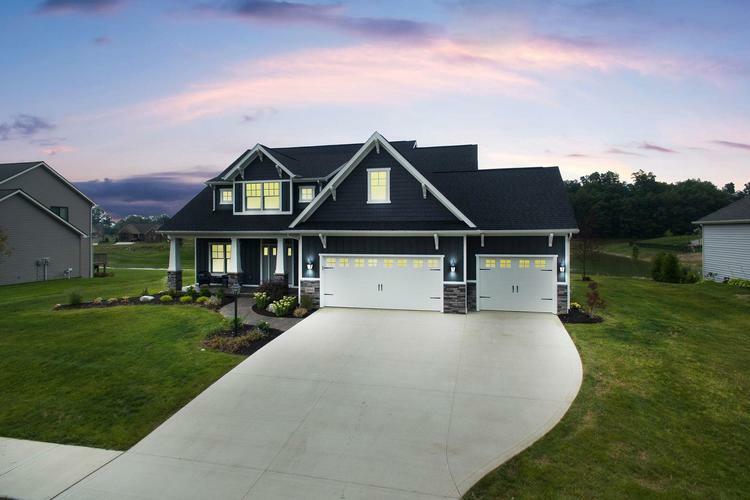 Incredible custom built Wannemacher home! Owners have upgraded and decked out every aspect of this home; professionally landscaped ($10,000), stamped concrete walkway and rear patio ($5,000). Upgraded black stainless steel appliances ($8,434) Irrigation system installed for grass & landscaped areas ($6,000). Enjoy the beautiful covered deck off of the kitchen overlooking the pond. This house has been thoughtfully planned and brilliantly executed. You can enjoy those views with your morning coffee from the sun porch. Don't let those gorgeous views distract you from the built-ins on either side of the shiplap fireplace. The unbelievable kitchen includes an extra long granite island, grey subway tile backsplash, impeccable black stainless appliances, including backless gas oven perfect for all your gourmet meals and also gorgeous lighting. Separating the kitchen from the garage is the family drop zone; half bath, mudroom with lockers, cubbies, and storage, and laundry room with folding counter. Upstairs you will find an expansive loft area with built in window seats as well as 4 bedrooms and an added fifth bedroom in the basement. The master bedroom and bathroom have all the amenities you've been looking for and the special touches you want; custom tile shower with half glass wall, separate stool room, dual vanity, and giant linen closet. Don't miss the shiplap in the tray ceiling!! Listing provided courtesy of Pinnacle Group Real Estate Services.